The Kardi Issue, August 1875. Rouletted 10½ on one or two sides. † Gibbons distinguishes between shades in all stamps of the the first issue and paper variants in the 8sh. There are no Scott #5 - #10. Printed in blocks of four with colors and on paper bought in the Bazaar. 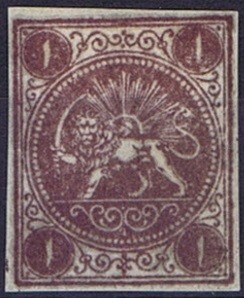 The stamps therefore vary tremendously in appearance. No stamps are known postmarked, but pen cancellation exist. "The Rouletted or "Kardi" issue could be considered the first issued stamps after the reorganization and creation of the modern postal system in Iran by Herr Gustave von Riederer. The Kardi stamps was first used between Teheran and the northern suburb of Shemiran in August of 1875." We are grateful to Mr. Greenway and Mr. Sadri for their help. You could visit Rainer's Persia Pages if you wish to see some images. BEWARE: these pages seem to be a little dated. Shahi is sometimes written chahi. Walker (see Syria) writes, " IRAN issued its first stamp in 1868 and is relatively uncomplicated philatelically, although one should include Bushire #N1 in the lran section. "